Since Friday night, we have been on the road. We will end up in Vegas before heading back home, but we wanted to check out Lake Tahoe, as that is where my fiance and I will be getting married this summer. Our first stop was Wendover, NV to sleep and gamble, not necessarily in that order. From there, we headed west on I-80 towards our destination of Lake Tahoe, CA. Along the way, we stopped in Elko and Winnemucca to have lunch. After passing through Reno and traveling south on US-395, we arrived in Lake Tahoe and spent the next 18 hours there looking around and getting familiar with a place that I had never been. On Sunday, we left and drove along with eastern edge of California to Victorville and Apple Valley, to visit my sister and my mom’s grave. Monday afternoon, we made the short drive into Las Vegas to check in at the Hilton Grand Vacations Club on the Las Vegas Strip for three nights. And as most people do while they are here in Sin City, they gamble. I’m not a big gambler, and neither is my fiance, but we do like to entertain ourselves at the slot machines. So we took a walk out on the strip, passed through Circus Circus (which is rumored to be demolished in the future) then ended up at Slots-A-Fun. With $30 still in my pocket, I made my way through the isles of slot machines, looking for one that could not only take my money, but give me a few hours of fun, while getting a nice buzz from the free drinks. After playing a few that were not all that great, I was thinking that I wasn’t going to find anything fun…. until…. My love of Star Wars is big. And to find a slot machine theme based on Star Wars was pretty exciting. And it did not disappoint. It was not only fun, with it’s Jedi Training mode, various movie clips that played within the reels and bonus spin modes, it was not only cool, but it also paid out really well. And I had no shortage of drinks, which helped add to the fun time I was having. So how do you top a Star Wars slot machine? One word: Indy. Talk about geekdom in the gambling world. Major kudos to George Lucas for not being shy about licensing his creations to all parts of the entertainment world. I had another hour of fun on the slots, with bonus spins and video clips from the Radiers movies. And I made another $10 in the process, too. By this time, we were getting hungry for something other than Coronas, gin and tonics and white russians. So we stumbled across the strip made our way to a casino cafe and called it a night. 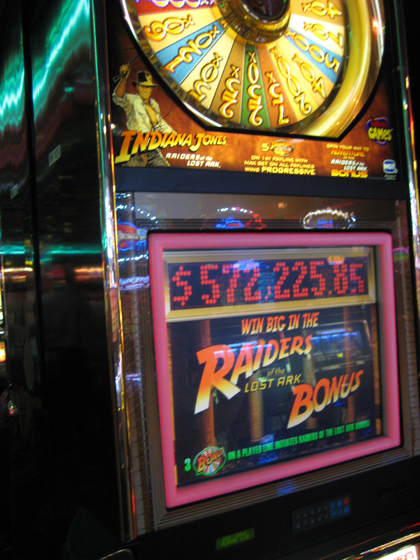 Star Wars AND Indiana Jones slot machines?! I am SO going to Vegas! 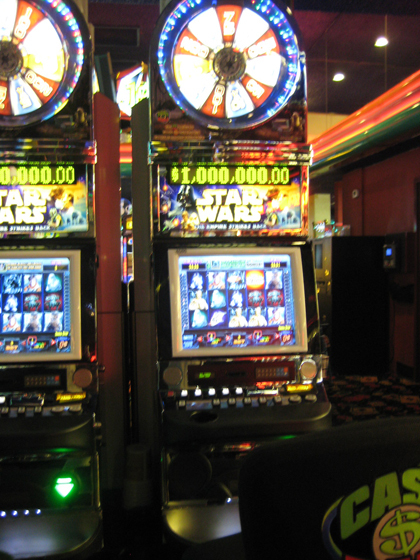 Most of the Vegas casinos have the Star Wars slots, some have different versions like one with a “Dark Side” theme. Very fun and you don’t mind too much if you lose. Let me know when there’s a StrongBad/Homestarrunner machine. How did I forget about this blog post when I posted mine? I actually went straight from Indiana Jones to Star Wars on my last Reno trip in the Airport! I lost with Jones but won with Yoda. – I actually cleared more than $600 with the power of the force.